A song I wrote to express the loss of a friend who died too young. The passage of time as the Earth goes on it's journey around the sun is used to show how the seasons may change but there is renewal after a period of dormancy. 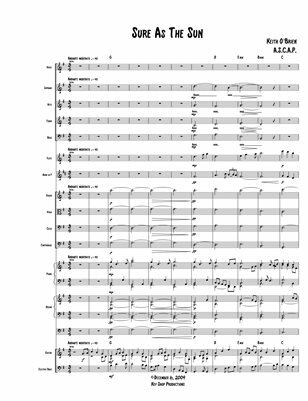 The song is written with a Solo Voice with Soprano, Alto, Tenor and Bass Choral setting. Accompaniment is Flute, French Horn, Violin, Viola, Cello and Double Bass with Piano and Organ. I wrote it originally using Guitar and Bass Guitar which is here in this arrangement. I added the Guitar chords on the Solo Voice line if you'd like to strum or play a picking pattern and sing along on the Solo Line.